New Food: Tomatillo literally "little tomato" but also called "Chinese Lantern Plants"
Ideal season to purchase: Available year round as primarily imported from Mexico. How to select: Look for firm and bright green tomatillos. Avoid any with soft spots or discoloration. Where to buy: Regular grocery store or farmer's market. Mexican supermarkets are also a good bet! Whenever you have a green salsa at a Mexican restaurant, you are probably eating tomatillo salsa and didn't know it! Also called the "Spanish tomato," "husk tomato," and "Mexican husk tomato"
Flavor: A tomatillo is a sister to the tomato but doesn't taste anything like a tomato! 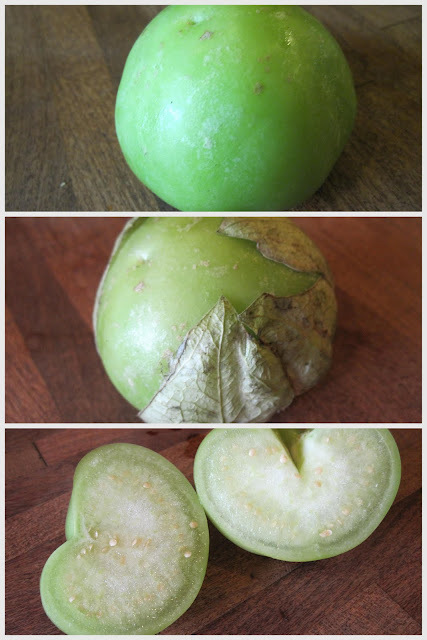 The best description is as a cross between a an apple and a lime. It has a sharp acidic taste but is very refreshing. You can actually cut them up and eat them like apple slices which are great! You just probably would only be able to eat a few slices since they are very tart. How to Prepare: Peel back the outer layer called the "paper calyx" and wash as the fruit will be sticky from the outer layer. Storage: Store for up to 3 weeks in the fridge. 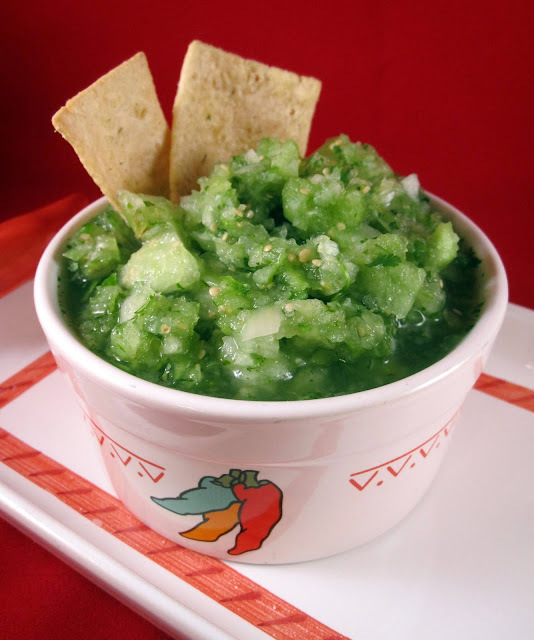 The most common recipe with tomatillos is a green salsa. 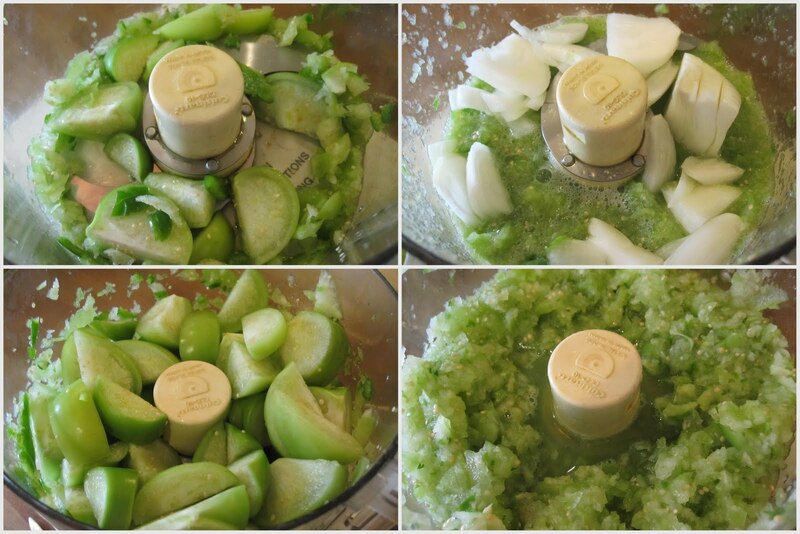 Below is a tart, fresh, and slightly spicy Tomatillo salsa, inspired by my dad's much spicier version! First, remove the husks and wash your tomatillos. Slice into quarters. Slice the serrano peppers and remove desired amounts of seeds. Chop Serrano peppers first in food processor so that they have the most time to get chopped into smaller pieces. [Nobody wants a big spicy chunk of pepper in their bite!] I used 1.5 deseeded Serranos and wish I had added a little more for kick. Test yours to see how much heat you want. In order to help chop the peppers first, place a few tomatillo pieces to add moisture. After chopping the peppers, add onions and cilantro. Pulse until desired consistency by try to not let it get too liquid-ey. I think chunkier salsa is better! Finally, add the tomatillos with garlic salt and white pepper. This will keep the tomatillos from turning to mush while pureeing the other ingredients. Test to see if desired spiciness and salt/pepper level are achieved and adjust as necessary. Serve with tortilla chips or over pork tenderloin, tacos, or tamales! Look at that rich green color, enjoy! Remove husks and wash tomatillos, cut into quarters. De-seed to desired spiciness level Serrano or jalapeno peppers. Puree peppers first in food processor with a few tomatillo halves to adequately chop peppers. Add 1/2 onion with cilantro to food processor and chop. Add remaining tomatillos with garlic salt and pepper and pulse until desired consistency. Use within 2-3 days for ultimate freshness or if making a larger batch and desiring to keep longer, bring completed salsa just to a boil on stovetop and then remove from heat before storing in fridge. You still have 3 days left to enter my giveaway! You won't regret it!